Previous: NYPD Only Arrests Minorities for Marijuana. Here's How They Do It. Next: Jimmy Carter Says "Call Off the Global Drug War"
It is time to "Change the Schedule of Cannabis, Cannabis Laws, and Drug Czar Laws"
After you sign the petition, email your friendlies, share on facebook, or twitter from the petition page. If you have a website grab the widget so your visitors can sign it without leaving your website. It is difficult to understand and believe Congress enacted a law requiring a government official to lie and to ignore science and medical studies. This renders the Office unreliable and a fraud. Though 68 - 84 % of this nation, depending on the poll, wants to legalize the medicinal use of cannabis, and science and medical studies have proven the therapeutic benefits and medicinal value of cannabis, we have been forced to live with outdated Draconian laws. It is time to change this. I will say after years of working with congressional offices that attacking the messenger is a sure way to fail. Compliment the messenger, attack the message. Remember that Drug Czar took a job for a paycheck. It likely does not represent his personal views, so getting cooperation through whatever mutual ground you can find is THE strategy on the hill that will work. Attempts at intimidation, coercion, or blasting these people publicly or their offices just works against your end goal. Cooperate, dialog and be patient because all of these people change. Start your relationships on the bottom and plan out about 5 - 7 years, then people you have known for years will attain positions of influence. It is not just as simple as saying that they are lying bastards, no matter how true it is, you'll look like a mentally ill person hollering the world is ending if this is the approach you take and no one will listen to you. Well put, Mr. Francis, that has been my philosophy my entire life. I wasn't around for it, but I'd imagine the Anti-Prohibition movement began in a similar manner as you described, but rather than co-operation they received imprisonment. Instead of dialog they received ridicule. When they started at the bottom they were violently shaken free from the ladder. 33-35 years later those in positions of influence have grown deaf as a prerequisite to obtaining those positions. And acting mentally ill in a moment of crisis is a natural response to an unbearable situation. 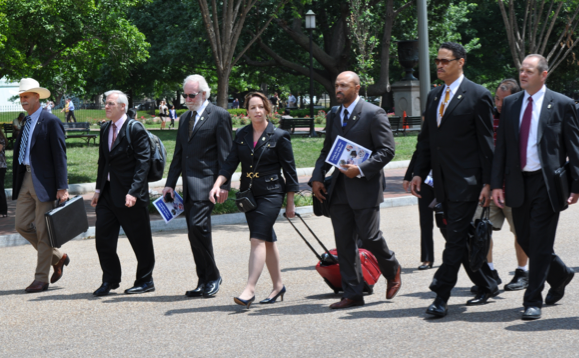 From Left, Howard Wooldridge, Executive Director, Citizens Opposing Prohibition (retired detective, Bath Township, Michigan); Eric E. Sterling, President, Criminal Justice Policy Foundation (former assistant counsel, Subcommittee on Crime, U.S. House of Representatives); Norman Stamper, LEAP (former Chief of Police, Seattle, WA, author of Breaking Rank); Leigh Maddox, Special Assistant State's Attorney, Baltimore City, MD, Adjunct Professor, University of Maryland School of Law, (former Captain, Maryland State Police); Neill Franklin, Executive Director, LEAP (former Major, Maryland State Police and Baltimore City Police); Matthew Fogg, LEAP, (former Chief Deputy U.S. Marshal); Richard Van Wickler, Superintendent of Corrections, Cheshire County, Stoddard, New Hampshire; (not shown, Terry Nelson, former supervisor, U.S. Department of Homeland Security). Thank you Eric, I was able to recognize everyone but you (sorry) and the guy at the far right. Sorry they snubbed y'all! To me these people are modern day Heroes. I love and Respect all these people I just wanna see Ron Paul President in 2012, together Ron Paul and this Group of Fantastic individuals they will make change happen the very change Obama lied to us about. I'm ashamed to have Obama as a president. I'm an Italian/American and the day Obama hit office I thought wow ..USA what a great country I was born in , I thought wow this guys gonna change things, and you know what he didn't , hes a coward, a hypocrite and most of all hes a liar. Dear Mr President SHAME ON YOU! !, and shame on me for voting for you, If I could take my vote back I would. ARE NATIONS ONLY HOPE IS RON PAUL , HES THE ONLY CANDIDATE BESIDES JOHNSON WHO I BELIEVE CAN TURN ARE NATION AROUND.